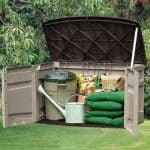 Outdoor Storage Cabinets - Who Has The Best? 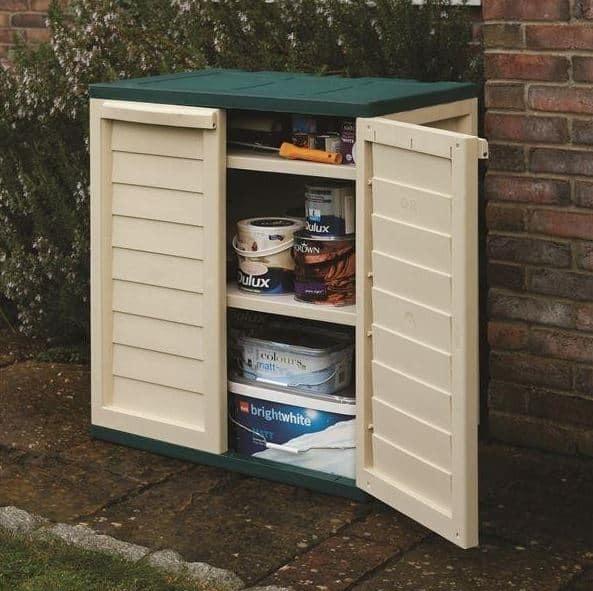 Looking for the best outdoor storage cabinets the UK has to offer? Then you’ve come to the right place! 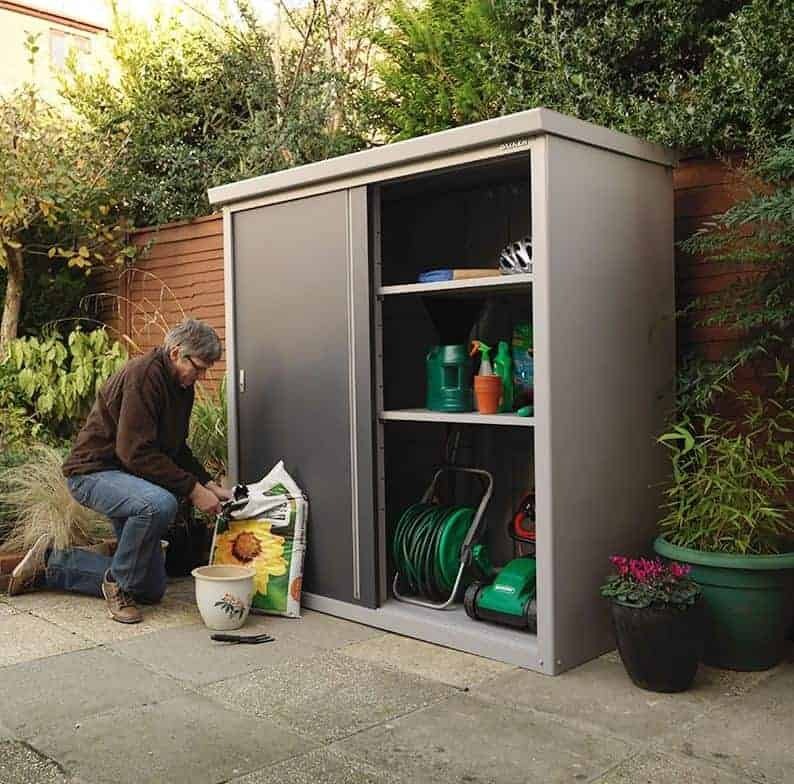 We have compiled a list of the top 10 outdoor storage cabinets currently on sale from the leading garden building suppliers. As these suppliers make up 95% of the market, you can be absolutely sure that the outdoor storage cabinets featured on this list are truly the best available. With years of experience in providing in-depth reviews of garden buildings and storage options, WhatShed knows exactly what makes the best outdoor storage cabinets stand out from those that are simply average. When choosing the best outdoor storage cabinets, we found something to suit everyone. We focused on more than just the obvious quality and cost factors, and each cabinet in the list has its own unique reason for being there. As there wasn’t a huge amount of outdoor storage cabinets on the market, we spent more time reviewing each one to determine which really stood out from the rest. Therefore, we congratulate the 6’x3’ Trimetals Guardian D63 for making it to the top spot. It managed to offer something that no other cabinet did, making it easily the best of the best outdoor storage cabinets out there. No matter what type of garden building you are thinking of investing in, WhatShed can help you choose the best one to fit your needs. Read our in-depth, comprehensive reviews today. 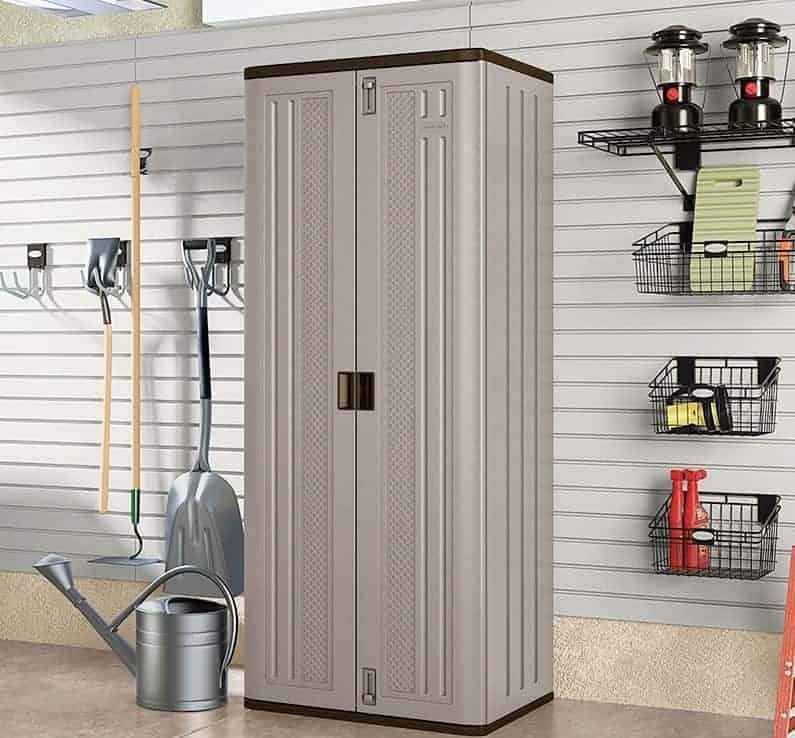 Out of all the outdoor storage cabinets we came across, the 6’x3’ Trimetals Guardian D63 is the one that truly stood out from the rest. This large, impressive looking cabinet doesn’t just offer an exceptional amount of storage space; it also comes with an impressively long list of great features. It also comes with an incredible Japanese design, ensuring it looks fantastic in any garden. Despite its large size and extremely strong build, it takes under an hour to put together. It is both weather and fire resistant so you can be absolutely sure that your storage is completely safe from any eventuality. This is a storage cabinet that is capable of fitting everyone’s needs. A heavy duty floor means you can store heavy equipment with ease and a 10-year guarantee ensures you are getting excellent value for money. There’s even a 2 year guarantee on all parts included. We also love its space saving design. The double doors allow easy access to your possessions and the fact they slide open also ensures the cabinet takes up as little space as possible. It requires absolutely no maintenance too. If you’re looking for outdoor storage cabinets that will really last as well as offering a stylish design, this is the one to opt for. There was one main name we came across when searching for outdoor storage cabinets and that was Suncast. There are several Suncast models available and this one is by far one of the best. It has a tall, very solid design and contains a double wall construction to ensure you can safely store valuable tools and equipment. With 3 shelves included you are given plenty of storage space and what’s most impressive is each one can hold up to 75 pounds of weight. Its heavy duty design is the main reason we included it on the top 10 outdoor storage cabinets list, but we also love the attention to detail that has gone into the smaller details. For example, the tall double doors have been fitted with strong metal mid-hinges for smooth operation, along with a lower and upper latch to keep them closed. The cabinet can also be padlocked if you’re going to be using it to store expensive tools. This is a particularly great option for those who have limited space available as what it lacks in width it more than makes up for in height; ensuring you still have plenty of storage space available. One of the difficulties you will come across on your search for outdoor storage cabinets is finding one that caters to different sized tools and equipment. The majority tend to come with equally spaced shelving that might not be suitable for all types of storage. That’s why we were so impressed with the 1’5”x2’8” Chaselink Titan Heavy Duty Multispace Cabinet. The included shelving can be clipped into place wherever you want them. This ability to customise the internal space is a stand-out feature that you won’t find with many other cabinets. As well as being ultra-practical, this cabinet is also very stylish. It comes with a great dark brown finish, which is again unique to this manufacturer. Plastic outdoor storage cabinets don’t tend to come with a stylish design so if you’re looking for something that looks good, this is a great choice. Considering its list of fantastic benefits, we’re impressed by the low cost of this cabinet too. 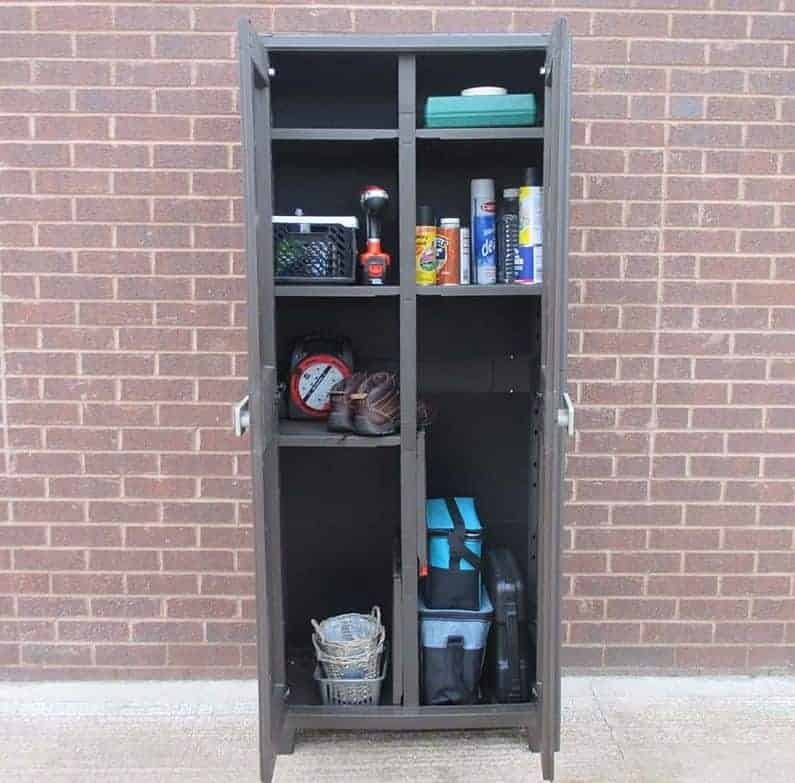 So if you’re on a budget and you have various sized storage to cater for, this is the best outdoor storage cabinet to suit you currently on the market. The Chaselink Titan Heavy Duty Low Cabinet is the perfect choice for those who require only a small amount of additional storage space. Like the Multispace cabinet available, this one also allows you to adjust the shelving to fit your storage needs. There are a few things we really like about this model compared to its competitors. Firstly, it has a great stand-out design. Constructed from high quality plastic, this cabinet is not only really affordable, but it also looks great too. The handles are located at the top of each door and we really like the chunky, modern design. We also like that you can add a padlock to make the cabinet more secure; making it a good choice for those hoping to store anything of value. 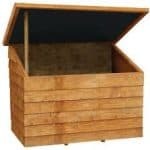 Despite its affordable price, this little cabinet is constructed to withstand all weathers. Out of all of the outdoor storage cabinets on the market, this one is really hard to beat in terms of versatility and value for money. Another Suncast model to make it onto the list, this great Resin Floor Storage Cabinet is deceptively spacious. Maintenance free, we felt this deserved a place on the list due to its affordable, durable and hassle free installation benefits. The resin construction is unique and ensures the cabinet is resistant to both dents and scratches. The shelving has also been reinforced so it is capable of storing up to 75 pounds in weight. 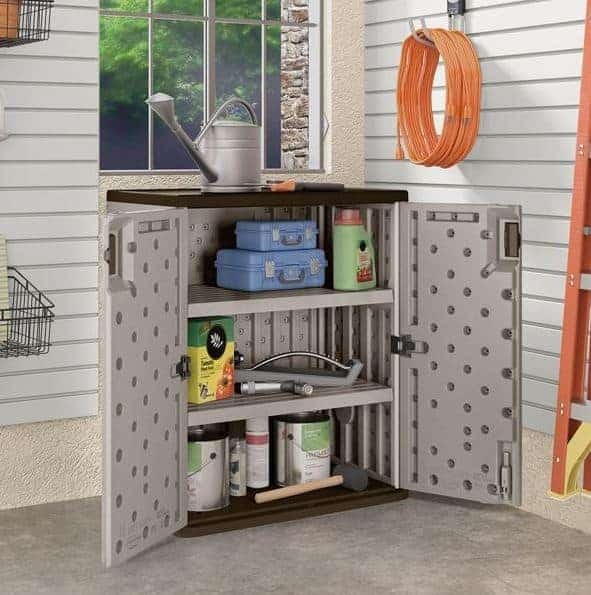 It is one of the smaller outdoor storage cabinets in the range, but it still provides plenty of space to store essential gardening tools. 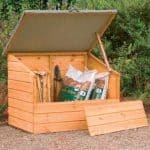 Unlike some of the other outdoor storage cabinets featured on the list, this one is designed purely to be kept inside a shed or other garden building. It is padlock compatible so you can easily keep your tools locked away from both thieves and children. This is one of the most durable and high quality outdoor storage cabinets of its size, and it comes backed by a great 5-year warranty. This handy little three drawer plastic cabinet is the perfect option for storing small tools and gardening essentials. 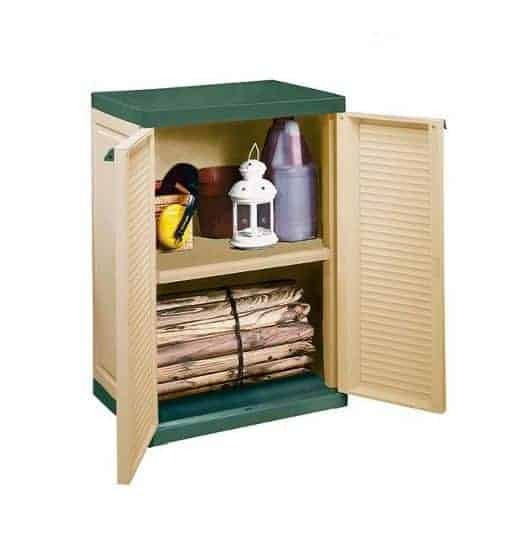 It is another cabinet that is designed to be used inside garden buildings and provides an affordable, durable storage solution. Most outdoor storage cabinets seem to cater to those who have medium-heavy storage needs. Therefore, we felt it was a good idea to include this in our top 10 list for those simply requiring a high quality, small storage cabinet. We especially like that you can choose from black or grey and both offer a very modern, stylish finish. Another benefit of this cabinet is the fact it doesn’t require any maintenance. It even comes fully assembled so you don’t need to spend any time trying to put it together. Each drawer is capable of holding up to 53 litres, so despite being small, it can still hold a lot of tools. 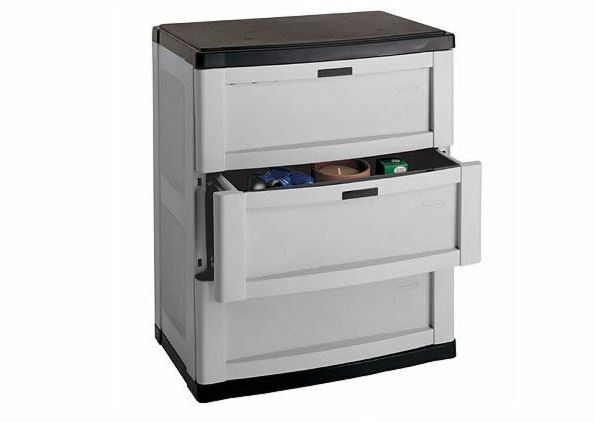 This simplistic double door plastic utility cabinet is offered by top brand Rowlinson. 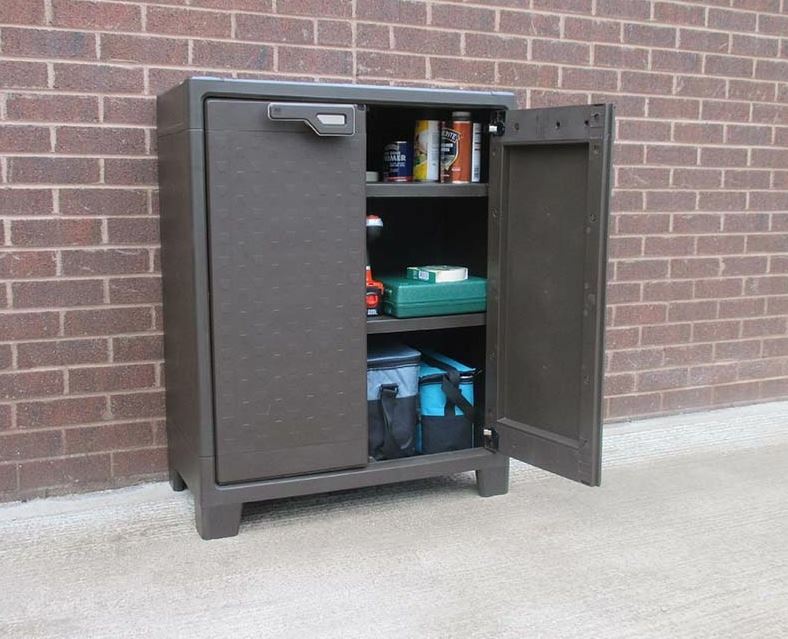 Whilst some of the outdoor storage cabinets on the list are designed to be used within an outdoor building, this one can be placed directly outdoors. It is fully weatherproof and requires no tools to put it together. It can also be connected directly to the wall which is useful for those who have space limitations. We feel this deserved a place on the list not just for its low, affordable cost, but also for its versatility. The shelving can be adjusted to fit your storage requirements. This is unusual for outdoor storage cabinets of this size. It’s panelled design also gives it a more pleasant visual appeal, ensuring it fits in well with any modern garden. What’s not to love about this stylish, compact and weather resistant cabinet? Featuring full-length double doors, this is one of the most affordable outdoor storage cabinets you can buy. We love its white and brown design which really stands out against the competition. Chaselink is one of the leading suppliers of outdoor storage cabinets so you know when you invest in this model it is really going to last. It comes with two adjustable shelves, ensuring whatever size tools you want to store they will easily fit inside. Another feature that earns it a spot on our top 10 outdoor storage cabinets list is the fact that it is also UV protected. This means it will not fade through exposure to high levels of direct sunlight. Instead it will look as good as new for many years to come. Basic but spacious, the Keter Medium Storage Cabinet wins the award for best value outdoor storage cabinets. This no frills model comes with a 2-year manufacturer’s warranty and has one handy adjustable shelf. 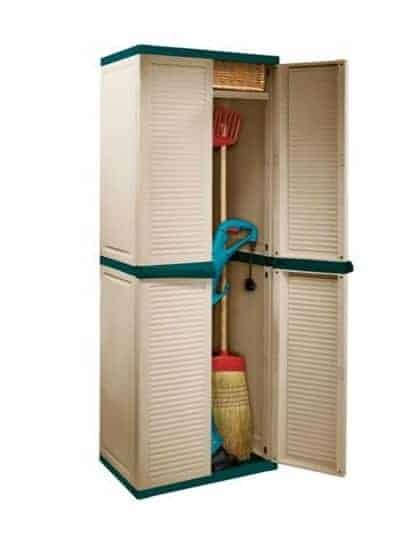 It is the second tall cabinet to be featured on the list, yet due to only having one shelf this one is more suitable for tall items such as rakes and brushes. You can even fit a garden strimmer in here. It is the ideal storage solution for the garage or shed and it comes at a very fair, affordable cost. 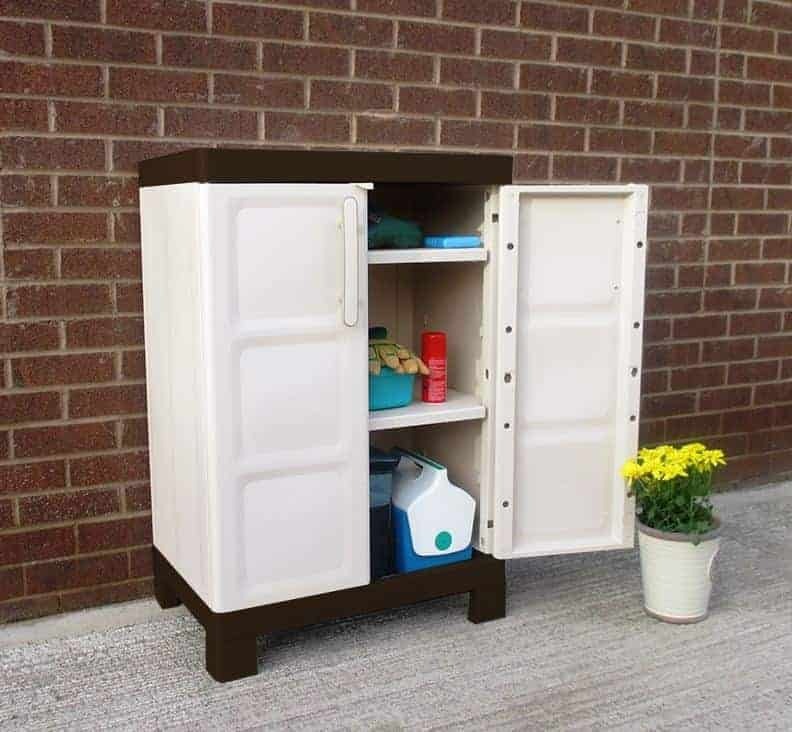 At number 10 we have the great value, budget-friendly Keter Compact Garden Storage Cabinet. This fantastic high cabinet may be the cheapest available, but that doesn’t mean it compromises on quality. Made by Keter, this strong, virtually maintenance free model comes with some excellent features. 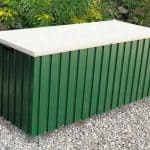 Fade resistant, guaranteed for 2 years and pad-lockable, it is a superb addition to any outdoor building. It benefits from a generously spacious design which allows you to store logs, as well as important gardening tools and essentials. 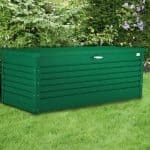 If cost and quality are the two main things you’re looking for when buying outdoor storage cabinets, this is definitely the model you absolutely have to buy. 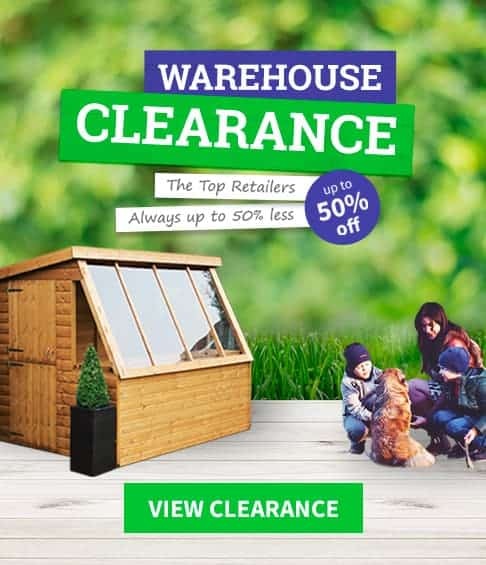 I am looking for a small storage cabinet for my balcony and am interested in the Chaselink small utility cabinet but having gone on to the website you recommend find it impossible to get hold of. When you read some of the reviews on these small cabinets they seem to leak water. Being elderly I want something small and neat and easy to maintain. Hi Jan, we need to update the league table as it looks like the merchant no longer stocks this product. 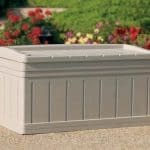 We would recommend a plastic storage container box if you are looking for something easy to maintain.